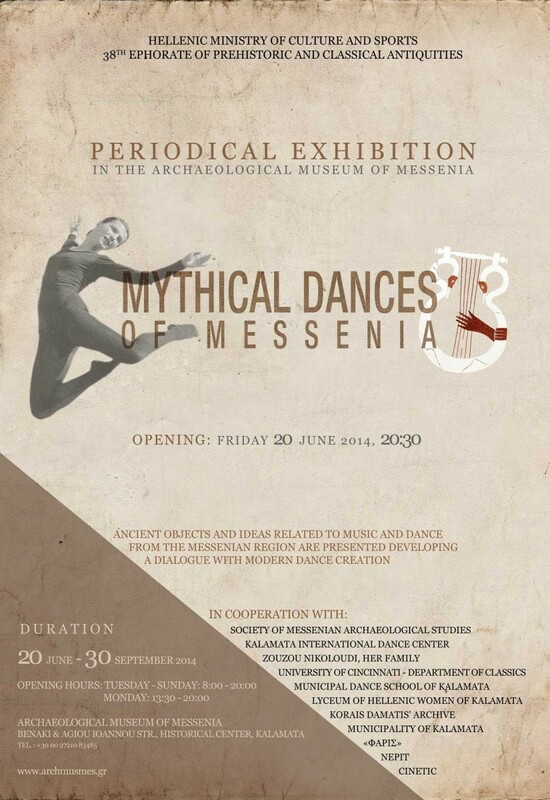 The 38th Ephorate of Prehistoric and Classical Antiquities announces the periodical exhibition “Mythical Dances of Messenia” at the Archaeological Museum of Messenia in Kalamata. The exhibition will be inaugurated on Friday, 20 June 2014, at 8.30 p.m.
Dance and music are inextricably linked in human nature as the expression of inner needs. ‘Movement’, ‘Rhythm’, ‘Ritual’, ‘Dancing’ and ‘Purification’ reflect only certain aspects of that expression. Dance as art is the conceptual platform for the association of ancient objects, symbols, ideas and written sources from the Messenian region with music and dance. The main objective of this exhibition is to acquaint the public with the above notions by connecting antiquity with modern culture. Moreover, Kalamata is known as “The City of Dance” since 1995 because of its annual International Dance Festival. “Mythical Dances of Messenia” will include twenty-five (25) ancient objects from permanent collections of local museums. Archaeological finds from ancient Messene and the Palace of Nestor will also be presented here for the first time. The periodical exhibition will be open from 20 June until 30 September 2014. Supervision of Architectural Design: Demetra Pikoula, Director – Section of Archaeological Projects, 38th Ephorate of Prehistoric and Classical Antiquities.